'Do we sound very selfish, Colm?" Una O'Hagan asks her husband Colm Keane as they talk about how they eloped to Scotland, more than two decades ago. This question comes after conversation about their co-written book about St Therese of Lisieux; Una's retirement from RTE; their month-long holiday in Greece and, movingly, how their tight bond helped them through the death of their only child, Sean, from cancer. They don't sound selfish at all, as it happens. Instead, they come across as one of the most connected and content couples I have ever met. They joke about Una being under Colm's feet now that she's at home all the time, and how they fight over the co-writing; but it's with fond laughter, and it's unconvincing. The day we meet, Una and Colm are up in Dublin from where they now live in remote Waterford and are on their way to see Brian Wilson in Vicar Street. We meet not far from RTE, to which Una commuted until her retirement at the end of February. It already feels like a world away, she says, and she has settled into this new phase of life beautifully. The pair had decided to write a book about St Therese about a year ago, they say. The book is almost a natural progression from Colm's books about Padre Pio, who had a devotion to St Therese, the Little Flower. Una seems slightly stuck for words when I ask if she and her husband have a very strong faith. "I'll answer that," Colm says, as Una hesitates. "When I started doing books about the near-death experience, about 10 years ago, I would have been a very lukewarm Catholic. Don't go to Mass, no Confession, nothing like that, but I would have been born into the Catholic Church. "But when I started doing those books," Colm says, "they really opened my mind. They revolutionised my thinking about religion, and Una and I, we're not religious in an institutional or organised way, but we would have strong beliefs about survival after death and about a moral code." On top of his three Padre Pio books, Una chimes in, Colm has also written several books about the near-death experience. And now, together, they have written The Little Flower, St Therese of Lisieux: the Irish Connection. "You don't have to be interested in religion to be interested in Padre Pio or Therese," Una says. "I was taken aback when you called it our faith," she adds. "Because most people ask are we very religious, and that's a much more loaded question." St Therese is a saint more familiar to Irish people than most. Una mentions a nun she met who says that Therese always helps her out when she's stuck for a parking space in Dublin, and many will remember the enthusiastic reception when the French saint's relics visited Ireland in 2001. This country's attachment to her runs deep, and it is the heart of Una and Colm's book. They recall a miracle attributed to her in Donegal; how de Valera visited her sister in Lisieux in the hope of an intervention for his failing eyesight; of the visit of her relics. The manner in which they tell Therese's story is most touching, however. They explain her teaching of the 'little way', which was egalitarian in a time when religion was very hierarchical, right down to who got into Heaven first. Pope Francis is a devotee of St Therese, and his life in an simple apartment and use of public transport while an archbishop in Buenos Aires were signs of his adherence to the little way. In their book, Una and Colm also bring to life a teenage girl who joined the enclosed Carmelite order - along with three of her four sisters - only to die of TB within its walls, at the age of 24 . There is, of course, an extent to which Una and Colm engage with the story of St Therese because of her very tragic death at such a young age. The loss of their son Sean, who was only 20 when he died on Christmas Day 2003, is an experience that inevitably colours and informs almost everything in their lives. Una speaks, in fact, of a photograph in that regard. Therese was in the convent with her closest sibling, Celine, also a nun, and an amateur photographer, who took one particular photo that grabbed Una. "Celine took photographs of Therese when she was dying, and there's something about that photograph that reminds me of Sean," Una says. "It's almost as if she's retreating, disappearing, going to another place. She is moving on to another place, and Sean was like that at the end. "Therese was very headstrong, but a very nice, gentle person, and Sean was like that, too," Una adds. "Subconsciously, that was a draw." "She was bullied at the convent and people took against her because she was so young and precocious, but I think that's what's so appealing about her. She was a real person with real experiences and problems. She had tragedy in her life and she came through it all, but then died young." Whatever draw there was to St Therese for Una and Colm, they began their book about her almost a year ago. "We started about six months before I retired," Una says, "and it helped with what has been a fantastic transition. And because we are working from home now, we can kind of get up and get on with it: there's no commute. If the sun is shining, we can get out and walk on the beach and discuss the what we're doing next. It's wonderful." 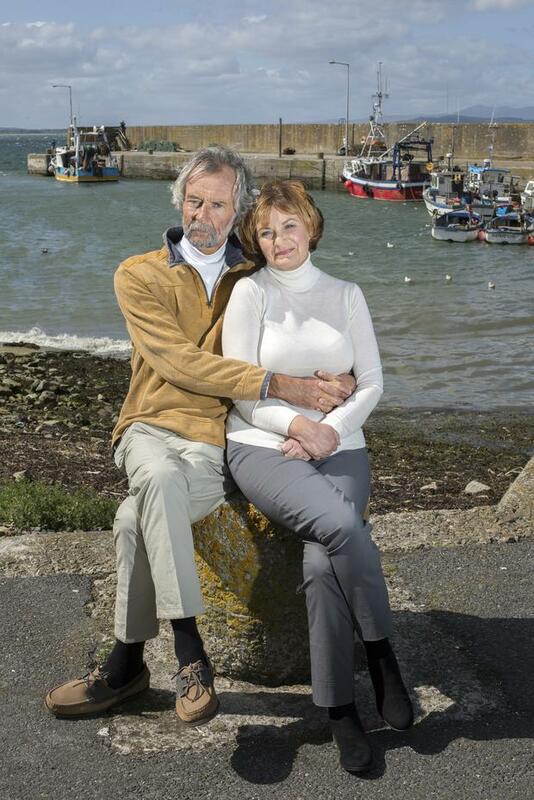 The couple have been several years in Waterford, where they moved from Bray, Co Wicklow. In her last years in RTE, Una worked 12-hour shifts, two or three days each week. She liked the long drive, listening to podcasts, and enjoying her own company, but she was ready for a change. "I had done the job for 34 years and I wanted to do something else," she says. "This was the perfect project. My last bulletin was the Six One news on the last Sunday in February. I drove down [home] to the Helvick Peninsula and we got snowed in for a week, and it was lovely. We worked like the clappers, and then we were lucky enough to get the best summer in 40 years, so it was perfect timing." Colm laughs when I ask how he coped with suddenly having Una under his feet all the time. "Oh, it was dreadful," he laughs. "Impossible. All those words. That's all off the record. On the record, it's been brilliant. I suppose it's just a change in how we do things. I mean, we get on very well, and we always have." Colm himself worked in RTE for almost 30 years as a radio producer and presenter, before leaving in 2003. Since then, he has been mostly writing, and has published 28 books. Clearly, Colm enjoys writerly solitude, so working with Una might have proved tricky, but the couple are so close that it works. They collaborated a few years ago, in fact, on a book about pets, called Animal Crackers, which they say was great fun, but the St Therese book was closer to their hearts. They would walk for hours on the beach discussing it, almost having it written before they came home and sat down at the computer, taking it in turns to be the one who wrote and the one who sat beside them. They learned how to be delicate in criticism of one another's words or ideas, and enforced the rule Maeve Binchy and her writer husband Gordon Snell had when critiquing each other's work: you could sulk for 10 minutes, but then you had to move on. The constant togetherness was not a trial, and I wonder is that closeness a result of Sean's death, or is it what got them through that loss. "Yes, we couldn't have done it otherwise. But it was still tough," says Una. "But it could have gone either way," says Colm. "Yeah, true," Una says. "We had been together for a long time, but in those things, you don't know what it is that gets people through. You're just staggering from day to day. I don't think there's a plan, do you, Colm?" "You keep going," Colm says, "and, in our case, from one disaster to the next. For us, it was always bad news, we never got good news. We weren't sleeping, we weren't eating properly. Una was on the news and looked shattered. But you just keep going. You have no choice, really." Colm recalls that while they got through each day of Sean's illness with the cancer and then his death, neither of them had thought about what shape the future would take without him. "It was the day of the funeral," he explains, "and we were down at the graveyard and I thought, 'Jesus, what do we do now? Do we shake hands and she goes off and I go off?' I never really thought about it. And as the last few people were walking away, I remember Una linked her arm into mine and just said, 'Come on'. And, eh, off we went. That was the first time I thought, 'I suppose we'll stay together and off we'll go'. And that is it, it was a hell of a time." "It was hell," says Una. But they are together and very together and, for this past year, very united in a project that chimes with how they think and talk about Sean every day, maintaining their family, to some extent, as a trio and not just the two of them. They rarely seek out time away from each other, Una says, and they have another project they might do together already fermenting. This experience has certainly not put them off collaboration, in fact, quite the opposite. That could be down to the being snowed-in, or the glorious summer, or the trip to Greece, though, they laugh. Or maybe just the novelty value of Una being retired and unshackled. "Maybe it's just the glow of the first six months," she says, "maybe it will all go to pot." Their laughter at the thought suggests otherwise. Not selfish, but certainly self-contained. Therese Martin was so intent on becoming a nun that, at the age of 14, she travelled to Rome seeking the Pope's approval. Therese Martin was determined to enter the Carmelite convent in Lisieux as a 15-year-old, even though the rule was that no one could enter before the age of 21. She pleaded with the convent's Superior and the Bishop of Bayeux, but they said no. Ever headstrong, she decided there was only one person who could grant her wish - the Pope! In November 1887, she travelled with her father and sister to Rome to petition Pope Leo XIII. It was a foolhardy plan, as it was forbidden for pilgrims to speak to the Pontiff. Joining a semi-public audience, Therese stood and watched as the Pope was approached by one pilgrim after another. Each one knelt and kissed his foot and hand. There was deathly silence; no one spoke. The Little Flower's turn was coming soon. Her heart beat faster. Turning to Celine, her sister, she asked for advice. "Speak," Celine instantly replied. Suddenly, Therese found herself on her knees before the Pope. "Holy Father," she said, her eyes filled with tears, "I have a great favour to ask you." He leaned forward, his face beside hers. "Will you allow me to enter the Carmel when I am fifteen?" "Well, my child," the Pontiff said, "do whatever the Superiors decide." Placing her hands on the Pope's knee, Therese tried again. "Holy Father, if only you say 'yes', everyone else would agree." The Pope stared at her and responded: "Well, well! You will enter if it is God's will." Seeing that she was about to speak again - and with her hands still clasped on the Pope's knee - the Noble Guards stepped forward to move her away. As they were about to force her to rise, Pope Leo XIII placed his hand on her lips, lifted his hand to bless her, and gazed after her intently as she left the room in tears. Therese was bitterly disappointed. Everyone else was shocked. One senior religious figure in Rome said of her actions: "This kind of thing is not seen in Italy." But there was no stopping Therese. On Monday, April 9, 1888, on the Feast of the Annunciation, Therese entered the Carmel at Lisieux. She was aged 15 years and three months at the time! Living conditions were harsh for Therese in Lisieux, where she was badly bullied. Meagre rations of food, a bed made of three planks, no heat except for a small stove in one room, and constant prayer and penance, were all experienced by Therese on entering the Carmelite convent in Lisieux. She wore a habit of coarse serge, rope sandals on her feet, and stockings of rough muslin. Rising at 5.45am in winter and 4.45am in summer, much of her day was devoted to prayer. The work was tough and tedious - washing floors, sweeping rooms, cleaning laundry, caring for the kitchen and sacristy. Rinsing clothes in cold water chilled her to the bone in winter. The laundry was steaming hot in summer. The ages of the other 20 nuns didn't help. Some were infirm and needed looking after. Not everyone was capable of work. The result was that most of the workload fell on the nuns of a younger age. Matters weren't helped by a Prioress who treated Therese harshly. One day, Therese overlooked a cobweb when cleaning a hall. In front of other Sisters, the Prioress said: "The cloisters are obviously swept by a 15-year-old; it is a disgrace!" There was no talking back, no arguing, disagreeing or contradicting. The rule was to accept criticism, even if falsely based, and offer up the sacrifice to God. Therese recalled another event: "A small jar, left behind a window, was found broken. No one knew who had put it there, but our Mistress was displeased, and, thinking I was to blame in leaving it about, told me I was very untidy and must be more careful in future. Without answering, I kissed the ground and promised to be more observant... I had to console myself with the thought that at the Day of Judgement all would be known." From then on, whatever the adversity, Therese smiled. No matter how severely her vocation was tested, she persevered. She suffered the deprivations confronting her without complaint, and dedicated herself to prayer, contemplation and work. In this cold, austere convent, cut off from the public and confined with a small group of nuns, Therese found the spiritual nourishment she so desperately sought. Therese developed her 'little way' in the Carmel. She wrote it down in her early 20s, as she was dying from TB. At the stroke of midnight, on Holy Thursday 1896, Therese arrived at her cell in the Carmel. She put out her lamp, lay down on her bed and placed her head on the pillow. Instantly, she felt a warm stream of liquid entering her mouth. The following morning, at five o'clock, she discovered that her handkerchief was drenched in blood. Unfortunately for Therese, she had contracted TB. With her health deteriorating and death looming, Therese wrote down her concept of the 'little way'. She had always wanted to become a saint, she said, but didn't have the sanctity required. There was another route to sainthood: do the little things you do every day, but do them with love and in the best way you can, and offer them up to God. "What matters in life is not great deeds, but great love," she argued. "In my little way, everything is most ordinary," she explained. It's just that those tasks are done with humility and commitment, and done to please God. By those standards, everyone can adhere to the little way. "All that I do, little souls must be able to do likewise," she pointed out. It was "a new way, very short, very straight, a little path." In time, a succession of Popes, authors, statesmen and philosophers, along with millions of ordinary people, were influenced by Therese's little way. The only sadness was that, by the time her philosophy was brought to public attention, her life on Earth had come to a close. Therese died on September 30, 1897. For many weeks, she had been immobile in her bed. She was, she said, experiencing "pure agony, without a ray of consolation". As death approached, she turned to her sister Pauline, who was Prioress, and asked was she about to die. Pauline told her she was. Looking at her crucifix, she uttered her last words, "My God, I... love... Thee!" She then sank back in her bed and passed on to another life. She was aged 24. One of Ireland's favourite singing stars from the 1930s-1960s, the French singer Edith Piaf, developed a lifelong devotion to St Therese following a miraculous cure. On the surface, Edith Piaf shared little in common with St Therese of Lisieux. Abandoned by her mother at birth, she was brought up for a time at her grandmother's brothel in Normandy, where she was cared for by prostitutes. She eventually took to the streets, where she scraped a living as a singer, became an unmarried mother and had a succession of affairs. Contrary to what we might expect, there was no one more devoted to St Therese than Edith Piaf. The reason was simple: she believed that Therese had been responsible for curing a serious eye condition she had as a child. Known as keratitis, it can result in blurred vision and sight loss. In Edith's case, the condition was progressing steadily and she was gradually becoming blind. Despite repeated praying by the brothel's occupants, no cure was forthcoming. Aware that a four-year-old child had recovered from a similar condition having prayed at Therese's grave, the decision was taken at the brothel to travel to Lisieux. "If Therese cured that little girl, she will cure my Edith," the grandmother said. The new arrivals, including Edith, joined the supplicants and prayed to Therese. Before they departed, they scooped up clay from the future saint's grave. In the following days, they applied the clay to Edith's eyes. Little more than a week later, Edith declared that she could see. Her sight had recovered, the keratitis was gone, her childhood restored. Piaf never doubted that she had received a miraculous cure. From then on, she always wore a medal around her neck commemorating Therese and, in later life, kept a statue of the saint beside her bed, and on the table in her many stage dressing rooms. She adopted Therese as her patron saint, praying to her and seeking her protection, while always thanking the saint for bringing her one of the happiest days of her life - "The day I regained my eyesight". Taoiseach and future President of Ireland, Eamon de Valera, visited Lisieux in 1938, seeking help from the Little Flower. In September 1938, Taoiseach Eamon de Valera visited Lisieux seeking a cure for his failing eyesight. He arrived at the Carmelite convent at 11.30am, on Friday, September 9, where he was received by Therese's sister Pauline, who was Prioress. He proceeded to explain his devotion to the saint. It dated back, he said, to earlier that year, when he and British Prime Minister Neville Chamberlain agreed the terms of the Anglo-Irish Trade Agreement. "Just as I was about to undertake these negotiations with representatives of the British Government," he remarked, "I obtained, through the good offices of a priest, a friend of mine, a precious relic of St Therese, and that relic never left me while the parleys continued." He then showed Pauline the medallion containing the relic, along with a volume in Irish of Therese's autobiography, which he had brought with him to read on his journey. He also spoke about his failing eyesight and asked that Pauline and her Sisters pray for a resolution to his problem. Unfortunately, there was no instant cure for Eamon de Valera's eyesight. Instead, in the years ahead, his problem worsened. In other ways, however, his life was miraculous. He continued in politics, both as Taoiseach and later as President of Ireland. He was also able to deliver notable speeches, using his memory instead of notes or manuscripts. When he died, in August 1975, de Valera was laid out in the habit of a Carmelite friar at Dublin Castle. We do not know his final thoughts as death approached. What we do know is that, throughout his life, he always retained fond memories of Lisieux. "When the hour of my death comes I want you to ask your sister to intercede for me," he once wrote to Pauline. He ended with a poignant line - written in French - saying, "I will never forget my visit to the Carmel of Lisieux". Relics of St Therese arrived in Ireland on April 15, 2001. Scenes of euphoria were witnessed up to their departure on July 2. More than 1,000 people stood in wait at Rosslare harbour to welcome the arrival of Therese's relics to Irish shores. Few in attendance anticipated the national outburst of devotion that would follow. Encouraged by the fine weather, between two and three million people filled churches or lined streets to pay their respects to the saint. A mile-long line of people queued at Beaumont church in Dublin. Sixty thousand waited for up to three hours at St John's Cathedral in Limerick. Forty thousand crammed into the Carmelite monastery in Tallow, County Waterford. Some were driven by a burning conviction; others came out of mild curiosity; more felt drawn to a unique national event. Churches were forced to keep their doors open through the night. Businesses put up their shutters. Houses were festooned with flags and bunting. Traffic ground to a halt. Flower sellers did brisk business. "People are buying mostly red roses, because in St. Therese's picture there are red roses all around her," one vendor explained. There were blue roses, too, with the seller proclaiming: "Buy a blue one for Our Lady." Miracles were reported in the national press. One County Louth woman described how her chronic arthritis was cured following a visit to Therese's relics. Another woman, from County Mayo, explained that, for the first seven years of their marriage, she and her husband had been childless. Having prayed to the Little Flower, they conceived their first child. They called her Teresa. The relics finally left the country as the mini-heatwave of the previous weeks was coming to a close. The bright sunshine seemed to be something of a metaphor for the visit, which had seen outpourings of religious fervour not witnessed since the arrival of Pope John Paul II in 1979. "It has been a very long few months," Fr. Linus Ryan, the visit co-ordinator, reflected. "It is not every day you have the privilege of carrying the remains of a saint around your country. It was a once-in-a-lifetime opportunity."